With his valuable collection of vehicles, what was curator Stephen Laing prepared to let us loose on as our first project, we wondered? Were we going to be dropped in at the deep end with a full restoration or would we be offered a “clean and polish” job as a test starter? 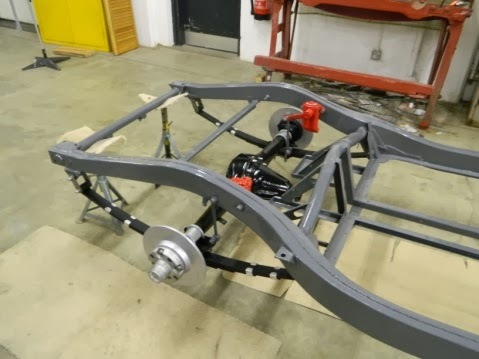 I suppose the answer lay somewhere in between the two with what can best be described as a renovation rebuild of a 1958 MGA sectioned display car. The car in question had been in the HMC reserve collection for a number of years and was one of only 300 or so MGA Twin Cam Coupes made by MG. The car was thought to have been shown at either the Earls Court Motor Show stand or the New York Motor Show in 1958. It was then sectioned and painted in an array of colours as a technical and demonstration vehicle for apprentices and students. Whilst for a short period it was displayed in the museum, it then moved to the reserve collection where its condition deteriorated. So with great excitement in November 2012 our first big project started. With around 25 of us involved in the project and all working different days of the week co-operation and planning was to prove essential. I think it fair to say that initially we descended on the car like vultures, stripping it bare very quickly. I’m sure there were some early concerns from HMC staff that we’d gone about it in the wrong way and would never be able to reassemble it correctly. Check back to read my next blog, where the restoration project is completed. In my last blog, I introduced the first car that we volunteers were let loose on, the 1958 MGA Twin Cam Coupe. Whilst the car was quickly dismantled with much enthusiasm, great care was taken to photograph everything in its full and then dismantled state, after which all the parts were labelled accordingly. It was also found essential, with so many people involved, to compile and keep up-to-date a detailed, daily logbook of work in progress. This also helped HMC workshop manager, Paul Gilder, to follow our progress and offer any help and advice when needed. To aid our renovation work we were able to use HMC’s wet bead blaster and shot blaster. Laser Tools kindly donated a large tool and spanner chest for our use. The chrome parts of the car were the only items we didn’t renovate ourselves. In addition, we only needed to purchase a few minor items like gaskets, oil seals and brake lines. All the paintwork was either applied by hand, (brush) or aerosol spray. The car had been a technical and demonstration vehicle for apprentices and students in its former life and has been sectioned and colour coded in an array of colours. This caused some confusion on repainting. Several components had their colour changed after consultation, but none more so than the cooling fan which went from red to yellow and then back to red several times. As the engine was partly sectioned it was never going to run again, but it was removed for a thorough clean and overhaul and then repainted. The gearbox was also removed and this underwent a complete overall, returning it to full working condition. After our November start, the car was finally reassembled and finished by the first week in June to the satisfaction of the HMC management. We must have done a good job as the car was put on display in the main museum straightaway and then exhibited on the HMC stand at the NEC Classic Car Show. It caused a lot of interest and the experience illustrated to us the need to get everything just right when restoring a classic car. We thus felt a little embarrassed when an MG enthusiast told us that we’d put the chrome bumper over-riders on upside down. However, further enquiries on the MG Owners stand confirmed that not to be the case, something which our photographic records also confirmed. You live and learn - something we volunteers constantly do here at Gaydon.